Fall begins tomorrow in this hemisphere, so it’s time to switch to hearty, comforting dishes. This dish is from the state of Indiana. It is so common there that everybody and their grandmother knows about it, loves it and makes it without following a recipe. 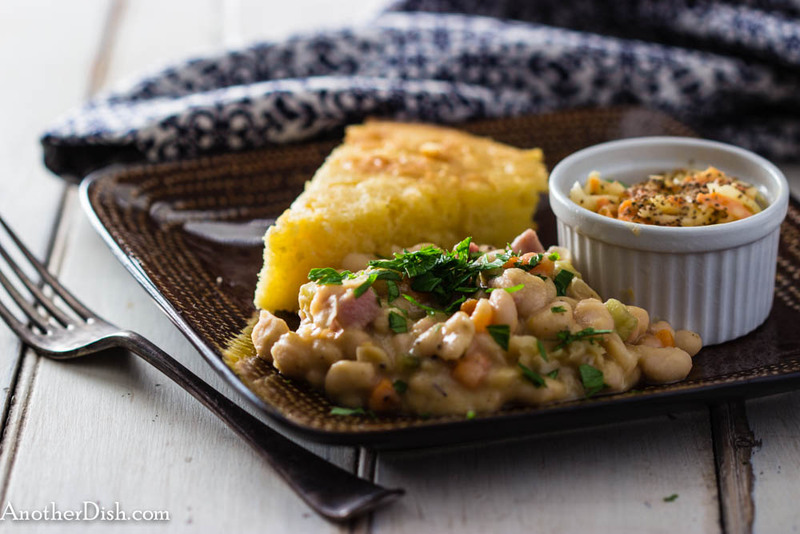 My readers know that I’m always up for “comfort food,” and this ranks as one of my favorites. So simple and delicious — I hope you’ll try this in the coming months or so! Also, if you’re not intending to cook it for a crowd, a half recipe turns out just as tasty. Rinse and drain beans. Set aside. Heat olive oil in a large Dutch oven over medium-high heat. Add onion, carrots and celery. Sauté 8 minutes. Increase heat to high. Add chicken stock, beans, ham, salt, pepper, thyme and nutmeg. Bring to a boil. Reduce heat to low and cook uncovered for 1 hour, stirring occasionally, until creamy and thick. Serve with cornbread and coleslaw. This entry was posted in Beans, Comfort Food, Main Dishes and tagged American, American Food, Comfort Food, Cooking, Food, Food Photography, Foodie, Recipes on September 22, 2014 by AnotherDish.